Copernicus died in Frombork on 24th May 1543. The legend says that the first printed copy of ” De revolutionibus ” was placed in his hands on the very day of his death. He is reputed to have awoken from a stroke-induced coma, looked at his book, and then died peacefully. A new documentary called The Principle, which is due to be launched on 10th October, is set to take on more than four centuries of established belief in the Copernican Principle. Such is the way of science. It’ll do this by presenting shocking new scientific evidence that suggests the Earth holds a special place within the cosmos. The film has already resulted in an absolute media frenzy, smear campaign, and storm of controversy as furious scientists vehemently defend their position – and that’s before they have even seen the evidence. Could we be on the edge of a radical new understanding of our universe and our place within it? Rick Delano, Writer and Producer of The Principle believes we are. Hence, Mr Delano states that the Copernican Principle is not a scientific fact, but rather a metaphysical assumption supported by profoundly convincing ideas and theories. His film, The Principle, is the first documentary ever to directly examine the scientific basis of the Copernican Principle by bringing together top scientific experts in a commentary, which he says, will leave us questioning our very place within the cosmos. For thousands of years, there was a prevailing geocentric view of the cosmos, in which the Earth was believed to be the centre of the universe. By looking up at the sky and seeing the Sun, Moon, planets, and stars moving about Earth along circular paths day after day, it seemed evident to ancient people that the Earth was stationary and the rest of the universe moved around it. Such a perspective was also in accordance with the God-centred worldview which maintained that a god or gods created us, and that there is a purpose to this creation. Nevertheless, Mr Delano explained in an interview with Ancient Origins that “the ancients were more than intelligent enough to understand that the same observational phenomena would be equally attributable to a rotation of the earth on its axis.” So, why then was this perspective not adopted in ancient times? “The simple truth is that the ancient world found it more plausible to believe that we were clearly the focus and centre of what we saw going around us,” added Delano. 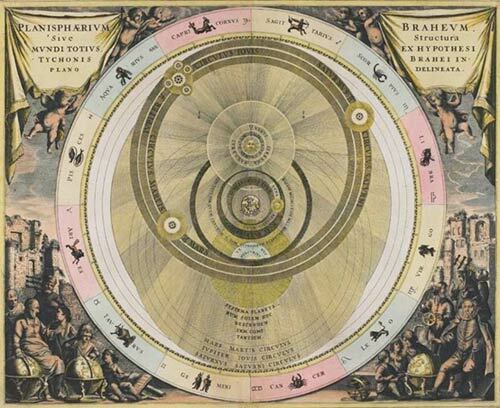 Thus, the geocentric model of the universe came to be adopted as the predominant cosmological system in many ancient civilizations such as ancient Greece (from 4th century BC), including the noteworthy systems of Aristotle and Ptolemy. The astronomical predictions of Ptolemy’s geocentric model were used to prepare astrological and astronomical charts for over 1,500 years. However, the work of Nicolaus Copernicus (1473 – 1543), a brilliant mathematician and astronomer from Royal Prussia, a region of the Kingdom of Poland, laid the foundations that eventually resulted in thousands of years of belief in a geocentric model of the cosmos being turned on its head. 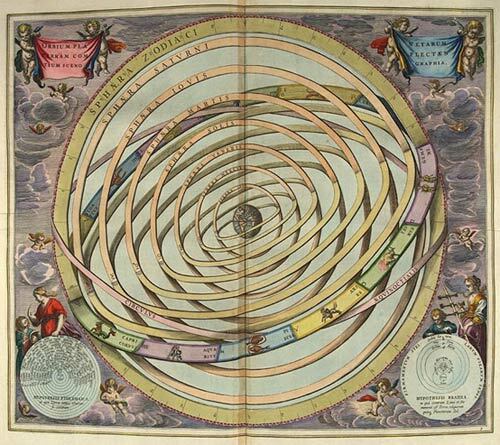 In his publication De Revolutionibus Orbium Coelestium (On the Revolutions of the Celestial Spheres) in 1543, Copernicus proposed the replacement of the geocentric system for a heliocentric model, in which the Earth and the other planets orbit the Sun, on the basis that heliocentrism could explain the motion of celestial bodies more simply than the geocentric view. The implication of this revolutionary idea was that Earth could no longer be seen as being in any central or specially favoured position, a concept which became known as the Copernican Principle. This was shocking and it was met by one stubbornly resistant force – the Catholic Church. After all, what would it really mean for civilization and religion to find that “we live on an insignificant planet of a humdrum star lost in a galaxy tucked away in some forgotten corner of a universe in which there are far more galaxies than people,” as Carl Sagan succinctly expressed in the 20th century? Such a radical change in world-view could not happen overnight and indeed it was at least another century before Copernicus’s ideas came to be well established. In the meantime, numerous scientists came forward to try to measure the Earth’s orbit around the Sun. The Danish astronomer Tycho Brahe (1546-1601), a brilliant experimental scientist whose measurements of the positions of the stars and planets surpassed any that were made prior to the invention of the telescope, proposed a model that attempted to serve as a compromise between the geocentric explanation and the Copernican theory. In this model, all planets except the Earth revolve around the Sun. In other words, the planets revolve around the Sun, and the Sun revolves around the Earth. “The remarkable thing is that the Tycho system absolutely duplicates the observations we see in the sky just as the heliocentric system does. There is no visual distinction at all between the Tycho system and the Copernican system,” explained Delano. Throughout the 16th and 17th centuries, huge advances were made in the field of astronomy and science through the work of Johannes Kepler, Galileo Galilei, and Isaac Newton, whose work is far too involved to be able to address adequately in this article. So we shall jump ahead to the 20th century and the work of Albert Einstein. Einstein, puzzled by the failure of every experiment to measure the universally assumed motion of the Earth around the Sun, searched for a reason to explain why this could not be measured. The result? 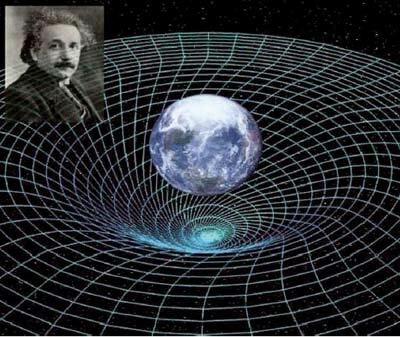 Einstein’s famous Theory of Relativity. Shockingly, Einstein maintained that absolute motion cannot be detected by any optical experiment as no particular frame of reference is absolute. In other words, the physics works just as well to have the Earth at the centre with the Sun going around, as to have the Sun at the centre with the Earth going around. Nevertheless, Einstein maintained that even though it may look like we are at the centre of the universe with all the galaxies moving away from us (as Edward Hubble observed through his telescope in the 1920s), this is only an illusion. He maintained that since space is not flat but curved, and since space is expanding, wherever one may be located in that space, the movement of the galaxies would appear to be radiating away from that point. This theory certainly supported the Copernican Principle that there are no centres, no edges, and no special positions. According to Delano, here is where the big problem comes in. Einstein’s flexible space/time. Image source. Over the last decade, a number of anomalous cosmological observations have emerged which do not make sense according to the Copernican Principle, the latest being the Planck satellite results of March 2013. While the science behind the findings is complex, to put it simply, the Copernican Principle requires that any variation in the radiation from the Cosmic Microwave Background (thermal radiation assumed to be left over from the ‘Big Bang’) be more or less randomly distributed throughout the universe. However, the results of three separate missions, starting with the WMAP satellite in 2001, has shown anomalies in the background radiation which are aligned directly with the plane of our solar system and the equator of the Earth. This never-before-seen alignment of the Earth results in an axis through the universe, which scientists have dubbed the ‘Axis of Evil’, owing to the shocking implications for current models of the cosmos. When you look at [the cosmic microwave background] map, you also see that the structure that is observed, is in fact, in a weird way, correlated with the plane of the earth around the sun. Is this Copernicus coming back to haunt us? That’s crazy. We’re looking out at the whole universe. There’s no way there should be a correlation of structure with our motion of the earth around the sun — the plane of the earth around the sun — the ecliptic. That would say we are truly the center of the universe. Cosmologists, astrophysicists, and others initially brushed off the strange finding as an artifact, and dozens of papers and reports followed trying to address the anomaly. But when the Planck results returned in March 2013, the alignment showed up in yet even higher resolution and detail, and has now been replicated across three separate missions, suggesting there is something more than an ‘artifact’ that is going on here. “The thing that has really launched the media hysteria about our film, is that we are pulling the covers off the dirty little secret that not only is there structure, that structure is related in astonishing ways to one and precisely one location in the universe, and it happens to be us,” said Delano. If there is something fundamentally wrong with the Cosmological and Copernican Principle, our entire picture of reality is about to change again, and the irony is that just like the last two great scientific revolutions, both were centred around this puzzling persistent question about our place in the cosmos. Whether The Principle documentary presents a convincing enough argument to seriously undermine the Copernican Principle and more than four centuries of science remains to be seen. But one thing is for sure, come the October 10 launch date, we can’t wait to find out.